I am not sure if this is definitively Chinese, or silver for that matter. Someone else thought it might be pewter. I figured the two letters were HK possibly meaning Honk Kong, although they may be NK or WK. It's hand made and definitely feels and looks old. Is this Chinese or something else? 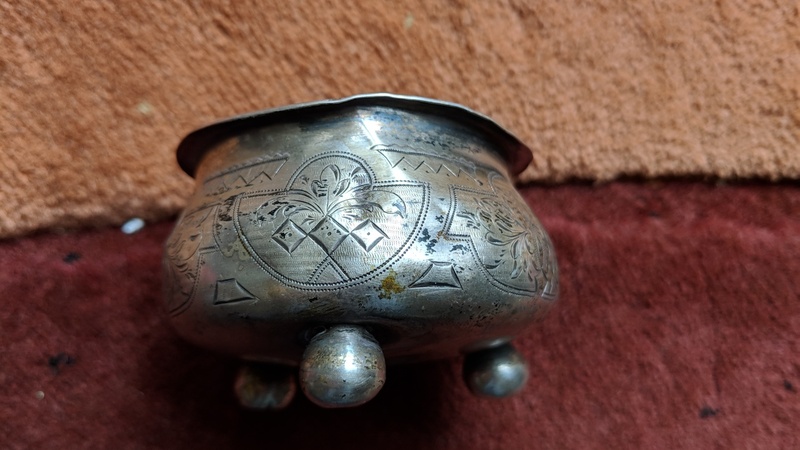 Anyway to know if it is silver or pewter? 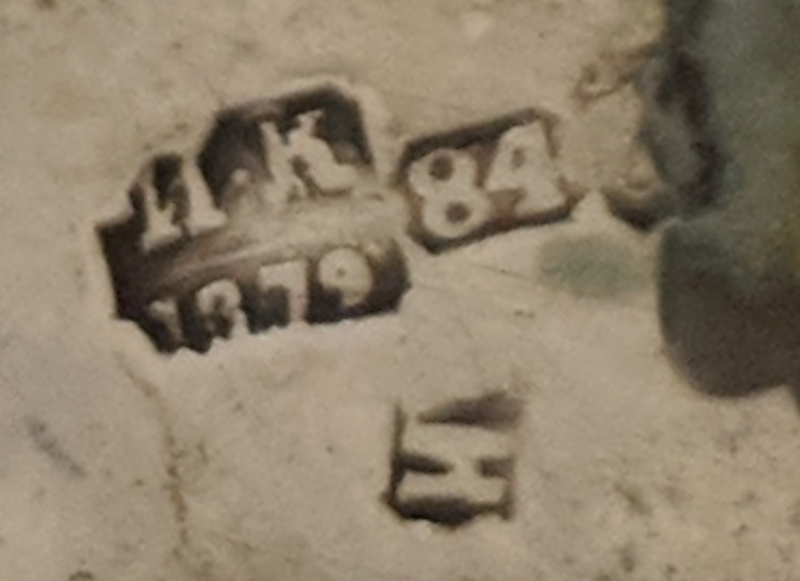 The letters look to me to be H.K 1879. Then 84 and an N or H. Any help would be much appreciated. Thanks. The first two are too early and rather rare. The Moscow assayer is the best candidate matching your mark. The first letter in maker`s mark cannot be seen, could be A, Л or whatever. 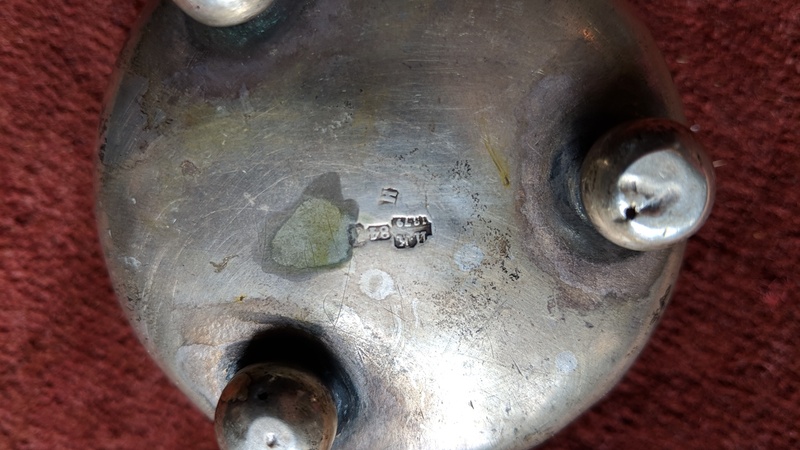 The second letter is either H (N)or K.
It is a Russian salt cellar. Usually there should be a little spoon with it but it is as here missing. The cellar is assayed in Moscow 1879. The assayer is not unknown he is Ivan Yefimovich Konstantinov 1874-1883. The maker's mark is so badly punched that mentioning a name would be more a guess than a fact. Thank you Qrt.S for clarifying and amending PL. In several Russian sources his years as Moscow assayer are different (1875-1882).No reference given,though.Possibly just repeated. Well better to have something than nothing. Unfortunately there is nothing new in that different sources might give different answers.